TS DEECET 2017 2nd 3rd/Final Phase certificates Verification Web Options Final Allotment Letter Download , College Wise Allotment List (Phase-III), Provisional Allotment and Payment Service(Phase-III) Download Final Admission Letter (Phase-III). TS DEECET Admission Letter 2017 – TS DIETCET Allotment Order, Fee Challan – tsdeecet.cgg.gov.in TS DEECET Allotment Order 2017 is available. So, the students who completed their Counselling process successfully can download the Telangana DIETCET Admission Letter 2017. We have also provided the TTC Entrance Exam Admission Letter along with the Fee Challan. So, go to the following sections of this page to get more information regarding TS DEECET 2017. The First Phase of Web Based Counseling completed from 04‐08‐2017 to 10‐08‐2017. Submission of preferences of colleges through web based application by candidates who have qualified in DEECET 2017 and are issued eligibility for admissions after verification of certificates conducted. All the candidates who have secured rank in DEECET-2017 for admission into two year D.E1.Ed. programme for 2017-2019 academic batch and are eligible for admission as per the verification of certificates held from 11-07-2017 to 16-07-2017 are informed that the 2nd Phase of web based counseling will be taken up as per the Revised Schedule given below. The eligible candidates intending to take admission shall submit their preferences through the link given at http://tsdeecet.cgg.gov.in as per the schedule given below. The candidates are advised to give more preferences so as to get more chances for allotment of seat. Candidates already admitted through first phase of web based counseling and intending to slide to other colleges can also submit options. The revised schedule and detailed procedure may be downloaded from the above website. Private Colleges: Tuition fee ‐ Rs.11,000/‐ per annum and Special Fee Rs.1500/‐ per annum. Exemption from payment of fee: The candidates belonging to the following categories are exempted from payment of fee provided they have produced the income certificate of parents issued by the Tahsildar after 01‐01‐2017 for claiming exemption of fee at the time of verification of certificates. Candidates those who have appeared for the TS DEECET Exam at various test centers and who are going to get an admission in the various DITE Colleges can get the DEECET 2017 Counselling Schedule, Venue/ Centers. Along with this, you may also have the information like Telangana State DITECET Required Certificates, and Web Options List here. All the students who have secured rank in Telangana State Deecet 2017 exam for admission into two years D.Ed course during the academic year 2017-2019 are informed that the 1st phase of TS DIET CET web counseling will be taken up soon. Candidates can download the Telangana Diploma in Elementary Education Common Entrance Test (DEECET) Rank Wise Counselling Dates from the official website @ tsdeecet.cgg.gov.in. The online exam of Telangana DEECET was successfully completed on 17th June 2017 by Dept. of School Education, Govt of Telangana and the results of same has been declared. Now, the candidates who have qualified in the TS DEECET exam are waiting for the counselling dates. Candidates can download it from the official website. PRESS NOTE : All the candidates who have secured rank in DEECET-2017 for admission into two year D.E1.Ed. programme for 2017-2019 academic batch are informed that the 1st Phase of web based counseling will be taken up as per the schedule given below. The eligible candidates intending to take admission shall submit their preferences through the link given at http://tsdeecet.cgg.gov.in as per the schedule given below. The candidates are advised to give more preferences so as to get more chances for allotment of seat. The schedule and detailed procedure may be downloaded from the above website. After the declaration of Telangana DEECET/ TTC results, the qualified candidates are eagerly waiting for the counselling schedule. Candidates can download the TS DIETCET Rank Wise certificate verification dates from the official website @ tsdeecet.cgg.gov.in. Candidates can get the admissions in the D.Ed courses in the Government District Institutes of Educational Training & Private Elementary Teacher Training Institutes through the DEECET entrance exam. Candidates can attend for the TS DEECET counselling by paying the counselling fee and the required documents provided below. After that candidate has to put web options according to the rank wise on the scheduled dates. Date of Exam 17th June 2017. Result Date 1st July 2017. Counselling July – August 2017. This page is updated with complete details regarding TS DEECET Counselling Process for Phase Ist & 2nd Phase. Candidates can go through the above table to obtain the brief details regarding the Telangana D.Ed Web Counselling. The Government of Telangana School Education Department released Deecet notification 2017 in the month of March or first week of April. So the interested candidates those who have completed the Intermediate from any institute may use this opportunity and apply to it before the last date. This DITECET Exam is taken to get an admission into two years Diploma in Elementary Education (D.Ed) in government district institutes of education training as well as in private elementary teacher training institutions in the state of Telangana. So, all the applied candidates have taken the DITECET Exam at various test centers decided by the TSDEECET officials. After that, now all are looking for the DEECET Counselling schedule to get an admission in various colleges. Telangana State Dietcet Exam Result released recently. A huge number of applied candidates have participated in the TS DEECET exam. Among all of them, some candidates were qualified. The Students who get good rank they will get in top colleges in various districts. Before going to join in the Telangana DITECET Colleges candidates need to attend the DEECET counseling process. TS DIETCET Certificate Verification 2017 details are here. Candidates are suggested to carry all the documents which are enclosed below to the any of the help lines to get verified the Certificates. At the time of Certificates verification, candidates need to pay the processing fee. After that candidate has to put web options according to the rank wise on the scheduled dates. Click on the below link for downloading the Telangana State DIETCET Exam web counseling 2017. The candidates may also refer the official website of tsdeecet.cgg.gov.in to view the web counseling process in detail. All searched candidates about this TS DEECET 2017 Counselling process that, Please click on the link and download the Telangana State Web Counselling Process with detailed information. TS DEECET Counselling will be going to conduct shortly for the eligible candidates. After officially notified by the officials we will update the Telangana State DEECET Counselling Dates here. Based on the Ranks obtained by the Student, TS Deecet Counselling will conduct at various centers. So, the Student can go to certificate verification process which is given by the official website. All the candidates who have qualified in the TSDEECET-2017 are hereby informed that "Verification of Certificates" at the District Institute of Educational Research and Training (DIET) concerned will be started from 11-07-2017 to 15-07-2017. The date, time and venue is given on their `Admit Card for Verification of Certificates' to be downloaded from the website www.tsdeecet.cgg.gov.in The candidates shall compulsorily attend for 'Verification of Certificates along with all the 'Original Certificates' given on the 'Admit Card for Verification of Certificates' failing which they shall not be allowed to submit their options for web based selection of colleges for allotment of seat in D.EI.Ed. for the year 2017-19 batch. The SCERT further specified that candidates must bring their original documents during the verification procedure. Those who fail to do so will not be allowed to submit their options for colleges in DElEd for the batch of 2017-19. A list of these documents is also mentioned in the candidates’ admit cards. The TS DEECET exams will be held in Telugu, English and Urdu mediums for 100 marks. Candidates will be asked questions on general knowledge, general English, general Urdu/Telugu, mathematics, physical sciences, biological studies and social sciences. 1. Candidate should without fail attend the session for verification of certificates on the above shown date and time. Otherwise they shall not be allowed to submit web based options for selection of colleges for admission into D.El.Ed for the year 2017-18. Any request for consideration of admission after being absent for the session for verification of certificates during the prescribed time will not be entertained. 2017 and the ‘Personal Details’ of candidate submitted by her / him in her / his ONLINE application for appearing at DEECET 2017. Hence, if the candidate fails to produce any of the relevant documents (as listed at (I) above) in support of the claim for admission the Rank assigned to her / him stands cancelled. per the Certificates produced during the session for Verification of Certificates shall be allowed to submit web based options for selection of colleges for admission into D.El.Ed for the year 2017-18 to be notified shortly. or causes disturbance as to whatsoever will be subject to disciplinary action as per rules. 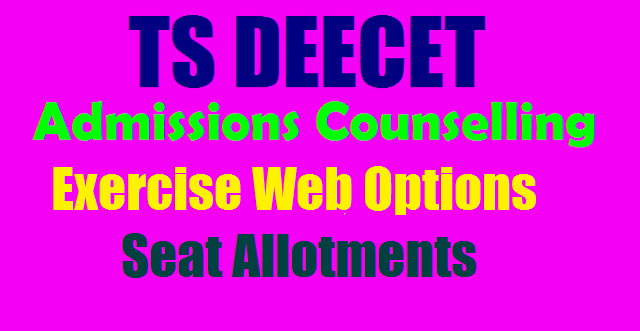 Search tags: ts deecet counselling dates 2017 rank wise-verification of certificates -list of candidates for verification diet wise @tsdeecet.cgg.gov.in , TS Deecet 2017 web counselling dietcet web options ttc telangana download admit card for verification , list of candidates for verification diet wise, warangal ,adilabad , hyderabad , karimnagar , khammam , medak , mahabubnagar, nalgonda ,nizamabad , ranga reddy, ts deecet counselling dates 2017 download telangana deecet certificate verification/ counselling schedule, web options, seat allotments, @ official website tsdeecet.cgg.gov.in,TS DEECET Counselling & Web Option Entry Dates 2017 Check Telangana DEECET Certificate Verification Dates with web option dates 2017 @ tsdeecet.cgg.gov.in TS DEECET 2017 Web options Online Option Started Exercise web options from 04-08-2017 to 07-08-2017 @ http://tsdeecet.cgg.gov.in, http://tsdeecetcounselling20170801.cgg.gov.in/webOptionsTS Deecet Seat Allotment Order Dietcet Allotment Order Download Telangana Deecet Seat Allotment Order Dietcet Allotment Order Download Telangana TTC 2017 College Admit Card Download.